Over 1/3 of York Countians are obese. 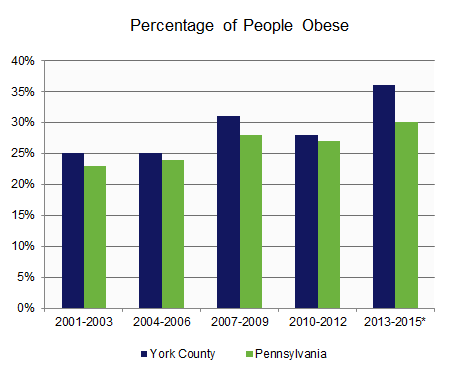 The obesity rate for York County is six full percentage points over Pennsylvania’s. Note *: Three-year summary periods should be re-benchmarked at the 2011-2013 estimate values due to the inclusion of cell phones and the new weighting methodology. Three-year summary periods up to 2010-2012 are based on landline samples only, and can only be compared to previous three-year summary periods.